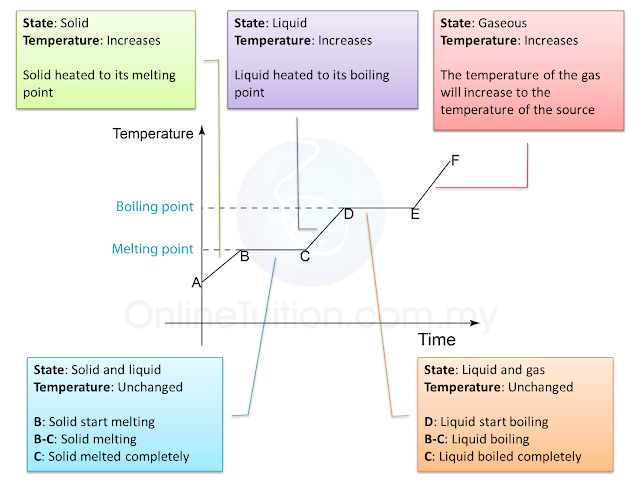 Figure below shows the change of the temperature when a solid is heated until it become gas. Temperature remain unchanged because the heat absorbed is used to overcome the force between the particles in the solid. The heat absorbed to change a solid to liquid is called the latent heat of fusion. Temperature remain unchanged because the heat absorbed is used to overcome the force between the particles in the liquid and also the atmospheric pressure. The heat absorbed to change a liquid to gas is called the latent heat of vaporisation.